Thread: Who are these guys? "...Generalleutnant Dittmar surrendered to troops of the U.S. 30th Infantry Division after crossing the Elbe in a small boat near Magdeburg. During his time broadcasting communiqués from the front he became known as the “Voice of the German High Command.” A widely respected radio commentator, he drew a following not only in Germany but also among the Allied monitoring staff...."
BUT WHAT WAS THE STICK USED FOR????? Last edited by Tiger205; 04-28-2010 at 03:19 PM. Capt. Abbes, Co. K, 117th with captured Lt. Gen. Kurt Dittmar. Bravo, my dear Mr. Tiger 205 – Wednesday, 25. April 1945, Magdeburg – Biederitz: General Kurt Dittmar, his 16 years old son and US Liutenent-Colonel S. T. McDowel, all safe and sound after successfully finished negotiations. My sincerest congratulations – job well done! And yes, I almost forgot that: stick is an excellent extension of human arm, very useful in docking operations and absolutely excellent for hoisting a flag. Not very much for the start, but we have to begin with something. Therefore allow me a question, my dear Mr. Tiger 205: is this picture somehow connected with the Italian forces in the Greek campaign? You are in a very good path, ITALIANS,and the Fauna & Flora is REALLY Greek. Can you guess the nationality of the other parties??? BTW – thank you for that truly magnificent compliment. You know, for a man with a highly accentuated myopia, who was even unable event to catch any trace of fauna on that snapshot, that really is a flattering remark. Once again - thank you very much. Well done, Congrat, it's your turn! Once again, our question is the same: who are these guys? The guy in left wears IMO the pre-war/early war soviet officer's uniform. So sorry for my protracted silence, my dear Mr. Tiger 205. As usually, my professional obligations had been very demanding, but finally I do have some spare time on my disposal. And yes – your observation is absolutely correct. Furthermore – that guy on the left got a rank of Lieutenant General back there in May of 1945. What can we know about the "major" looking guy on the right? Many things, my dear Mr. Tiger 205. 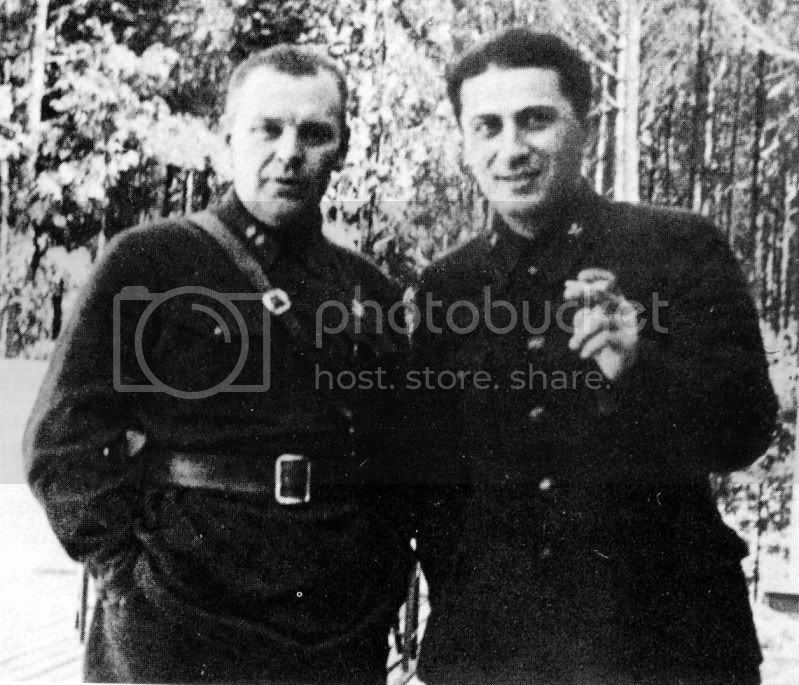 For example, the fact that he actually served as a Senior Lieutenant of the artillery units in the Red Army.